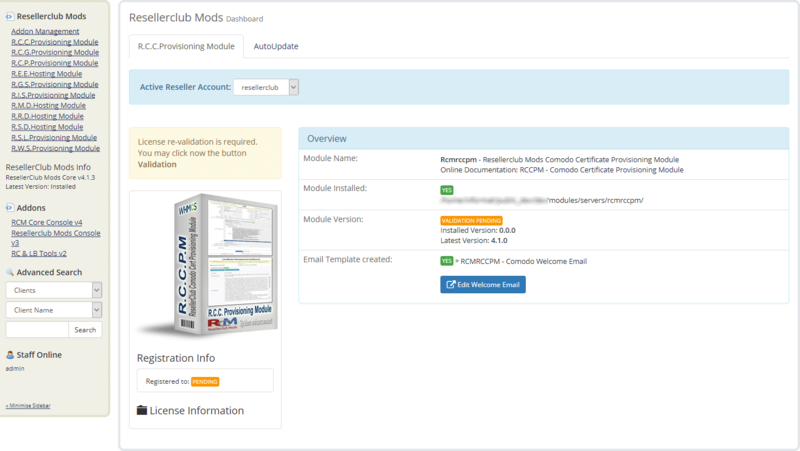 Download RCCPM - Comodo Certificate Provisioning Module from the product license details page TAB "Downloads". Unzip the file with your prefered decompresion software. Upload the complete folder "modules" from the unzipped local folder \rcmrccpm_X.Y.Z_PHP_5.X\ into the whmcsroot/ folder. The "whmcsroot" folder is where you have installed your WHMCS. 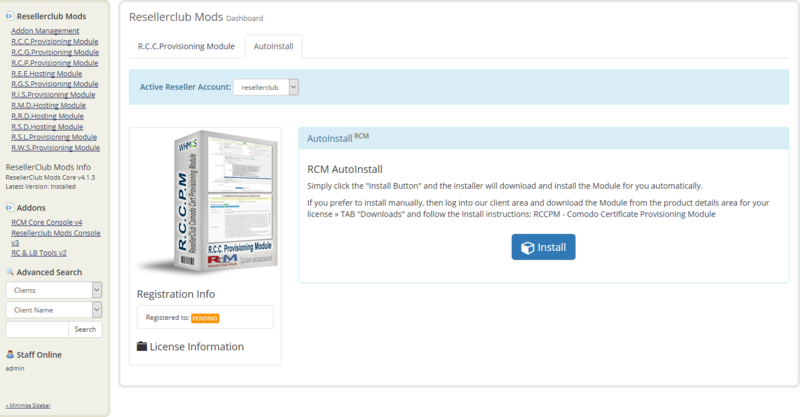 Goto to WHMCS » Addons » RCM Core Console v4 and access the R.C.C.Provisioning Module Dashboard from the left sidebar Addon Menu or from the Core Addon Home widget and click the "Validation" Button below the license details to finish the manual install. 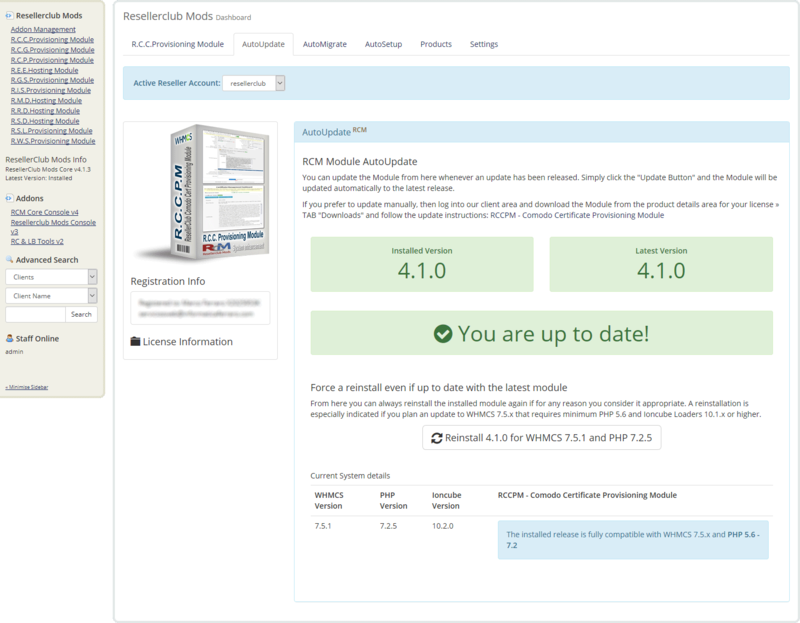 To manage the Module, navigate in WHMCS to » Addons » RCM Core Console v4 and access the R.C.C.Provisioning Module Dashboard from the left sidebar Addon Menu or from the Core Addon Home widget. 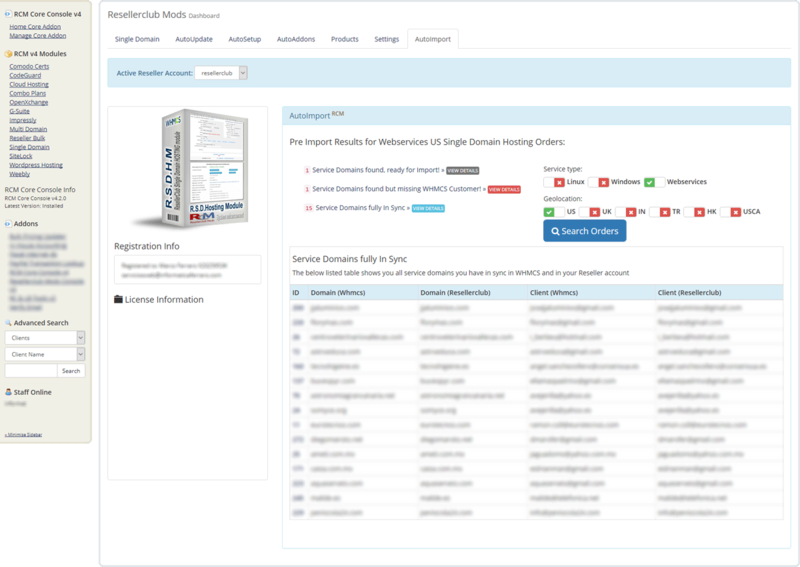 If this is the first time you install our Module to sell and manage Comodo Certificate plans, then start right away with the AutoSetup Guide. If you are using our v3 Module, then we suggest to start directly with the AutoMigrate Guide. By default, Selling Prices for Products will not be updated automatically with the Selling Prices from your Reseller Account when the daily cron runs. You can activate this option in TAB "Settings" or you can use the Button "Selling Prices ManualSync" to update all your Product Selling Prices in WHMCS. Both Options, AutoSync as well as ManualSync will fetch your Selling Prices from your Reseller Account. By default, Recurring Prices for Products will not be updated automatically with the Selling Prices from your Reseller Account when the daily cron runs. You can activate this option in TAB "Settings" or you can use the Button "Recurring Prices ManualSync" to update all Active Customer Products. Whenever we release a new update you will be notified instantly by accesing the Management Area in TAB "R.C.C.Provisioning Module". From TAB "AutoUpdate" all you need to do is click the Update Button and the Module will be updated automatically to the latest available stable release. 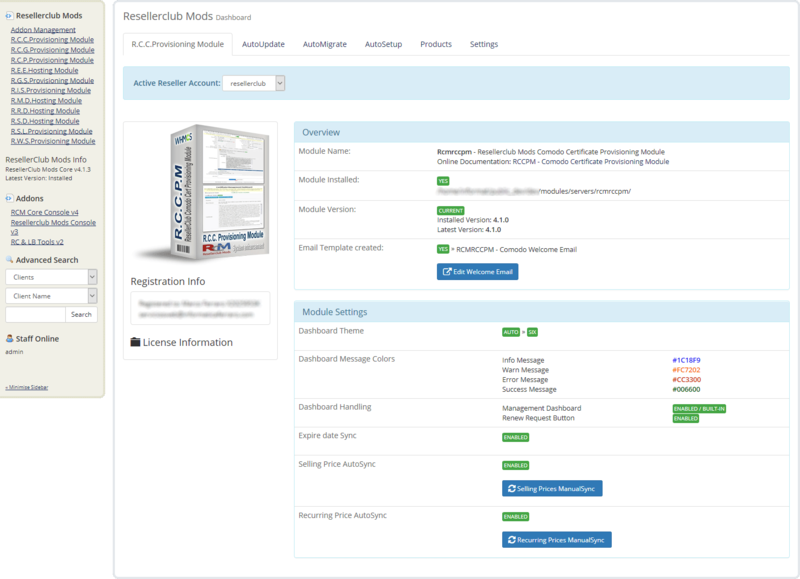 Goto to WHMCS » Addons » RCM Core Console v4 and access the R.C.C.Provisioning Module Dashboard from the left sidebar Addon Menu or from the Core Addon Home widget. Click the "Validation" Button below the License Information to finish the manual update. If you currently have Products configured with our v3 Module then they will appear in TAB "AutoMigrate". You can use the AutoMigrate Tool to migrate easily all your current products to the new module by clicking the Button "Migrate selected Products". If you want to migrate only some of the current Products then you can disable those Products with the enable/disable switch. 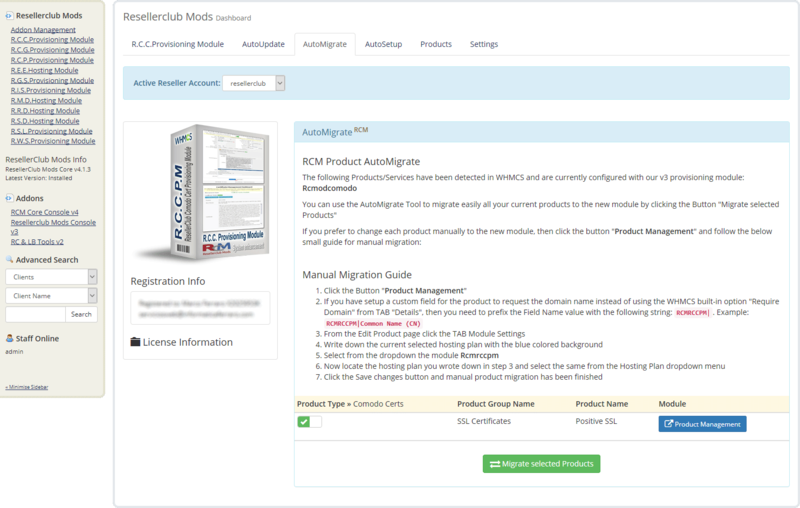 If you prefer to change each product manually to the new v4 module, then click the button "Product Management" and follow the small onscreen guide for manual migration. Selling a Certificate product requires always a domain name being associated. You can use the whmcs built-in "Require Domain" option to request the domain name or you can use a custom field for this purpose. Further details about the Global Settings are available onscreen. Selling Prices are setup automatically and taken from your Reseller Account. It is highly recommended that you review first the Selling Prices in your Reseller Account! Managing Selling Prices in WHMCS is now an obsolete management task. Simply maintain your Selling Prices in your Reseller Account Up to Date and make use of the new AutoSync feature to update the Selling Prices in WHMCS automatically. Further details about Importing Selling Prices are available onscreen. 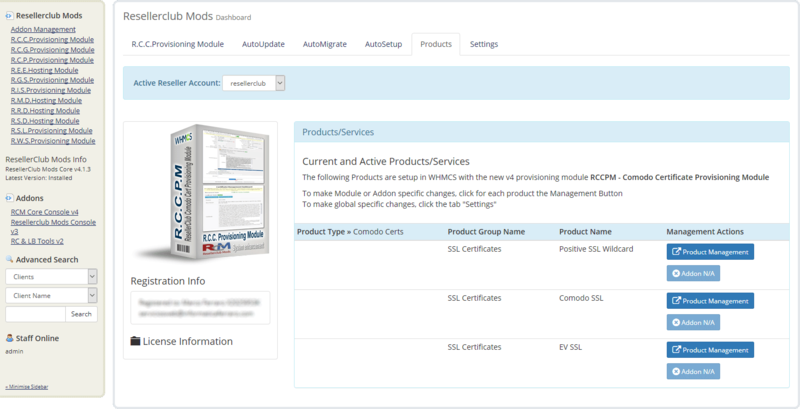 The Products TAB shows all Products currently setup with the v4 Module at a glance. 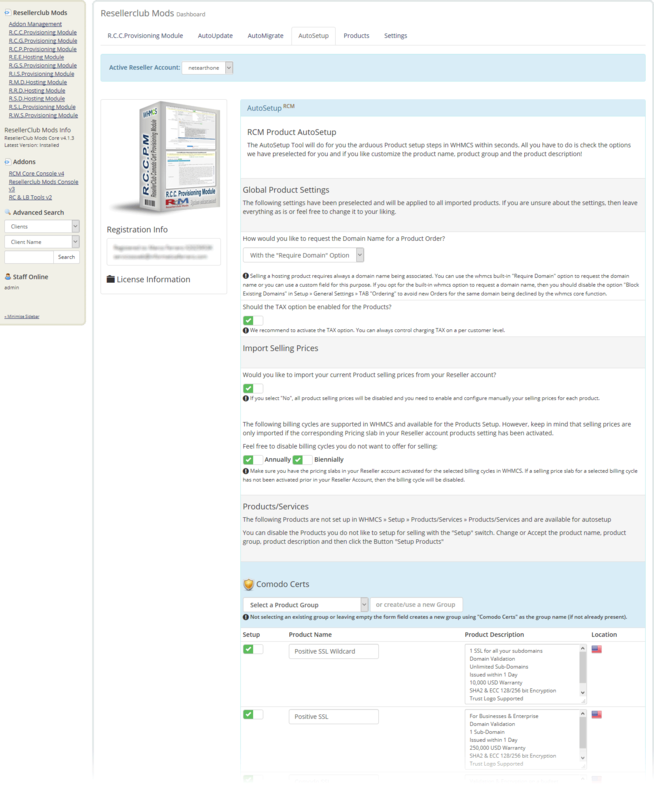 The Product Management Button allows you to access the Products Setup directly without the need to navigate in WHMCS to the Product for which you like to review the configuration or change the settings. Navigate in WHMCS to » Addons » RCM Core Console v4 and access the R.C.C.Provisioning Module Dashboard from the left sidebar Addon Menu or from the Core Addon Home widget.